Exclusive More than two months after breaching eBay's employee servers, a hacker who calls himself Vladuz remains at large, despite the best efforts of the online auctioneer's security team and officials with law enforcement agencies in the US and eastern Europe. So far, little public information is known for sure about Vladuz, who on at least two occasions has logged into eBay forums as an official customer service representative and then mocked the company's security. But the net is covered with bread crumbs left by a hacker who goes by that name, brazenly advertises cracking software and talks up his programming prowess. "This scam is perfect in many ways," he wrote on one site about a file he said steals eBay passwords. eBay officials say they are aggressively pursuing Vladuz with the help of the FBI and law enforcement authorities. And the online auctioneer insists his unauthorized access has been limited to servers used for employee email accounts, which are completely separate from the network where crucial customer data is kept. The last time Vladuz is known to have breached eBay's servers, the person, who posted under a pink banner reserved for official eBay representatives, said he was Romanian but not currently living in that country. An eBay spokesman said the company believes the hacker is Romanian. Vladuz's break-ins may be limited, but his work has been accompanied by what critics say is a sudden spike in the number of fraudulent auctions on the site. As evidence, they point to the sharply increased volatility in the number of auctions being offered, and then removed, from hour to hour since the end of January. On Jan. 31, for example, the number of listings swung from about 13.95m at 3 AM New York time to about 12.2m an hour and a half later, according to this chart from MedVed, which continuously tracks these figures. Over the next 13 hours, listings fluctuated between those extremes three times, making the graph (immediately below this paragraph) appear like a roller coaster, with each slope representing about 1.75m auctions. Many daily charts since then show a similar pattern. It wasn't always this way. 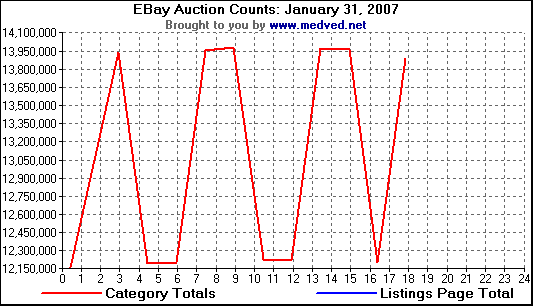 On Jan. 29, 2006 (MedVed didn't supply figures for Jan. 31 of that year), the graph maps a single downward slope that moves from about 14.5 auctions to 14.05, a difference of about 450,000, or about one-fourth of the heaviest recent activity. (The latter chart, below, is typical of account volume prior to Jan. 31.) To critics, the recent volatility is proof of an increase in the cat-and-mouse game playing out between fraudsters and eBay's security team. Many suspect Vladuz and his clients are responsible for the supposed increase in fraudulent postings. 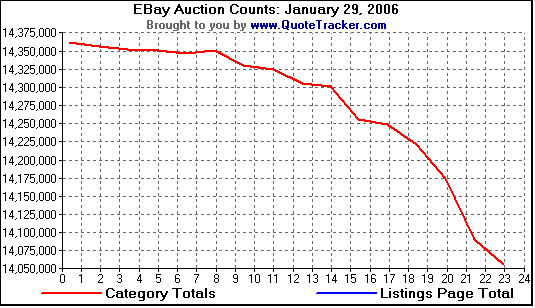 An eBay spokeswoman says the MedVed numbers "far exceed our real activity in this area." She also said the swings are caused by many variables, including batch processes and the timing of new code roll-outs. "My team looked at the data and there just isn't enough information there to tie the swings in listings that they show to any one cause," she writes in an email. She declines to disclose how many accounts are removed due to fraud.